To ask other readers questions about The Code of the Woosters, please sign up. Can this book be read as standalone? Or we have to read other books in the series to read this? Robert Salisbury It can certainly be read as standalone. Is it all a Bertie story or his cousin of his friend ? Mary Ann This is a Bertie story. A classic piece of Wodehouse silliness, involving Bertie Wooster, his formidable Aunt Dahlia and (of course) Jeeves in a scheme to steal an 18th century cow-creamer during a weekend party at an English country house. Written in 1939, it also features a would-be fascist dictator of England named Spode, head of an organization called "The Black Shorts" (by the time he started his movement, the shirts had already been taken). No one weaves a plot like Wodehouse. Also, if you have a cow creamer, guard it with your life. This is my second reading of Code of the Woosters and I can definitely say the No one weaves a plot like Wodehouse. Also, if you have a cow creamer, guard it with your life. A buddy read with a secret group which includes Dan 2.0 and Erin. For those who somehow manage to avoid knowing anything about this classic British humor series the main heroes are Bertie Wooster and his servant Jeeves. Bertie's job is to get into all kind of absurd and improbable (from the normal logic point of view) situations arising from his noble attempts to help his countless aunts and friends and Jeeves' job is to get him out of yet another trouble using some truly ingenious tricks. This t A buddy read with a secret group which includes Dan 2.0 and Erin. This time it all started very much innocently. Bertie suffering from a hangover from a previous night's party visited one of his aunts - Dahlia. She asked him to go to an antique dealer to pick up a cow-creamer for her husband - an antique collector. At this point I have to talk about this particular kitchen utensil. 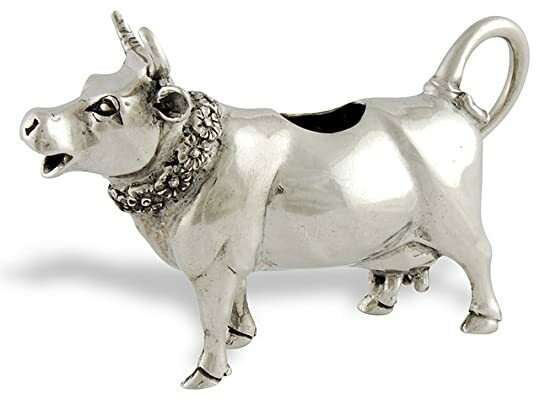 A cow-creamer is a creamer (a vessel to serve cream in, for example for tea) made of silver in form of a cow; according to the description and Bertie's impression very ugly. We all know that there is a very fine line between an enthusiastic collector and fanatical one, so seemingly easy mission of Bertie turned out to be very important. Bertie managed to fail, completely and promptly. This failure resulted in his visit to a countryside, double, triple, and quadruple blackmail, desperate attempts to help two couples in love overcome all obstacles in their way, equally desperate attempts to stay out of jail, and avoid getting beaten to pulp. May I remind you the centerpiece of all this excitement was a cow-creamer which antiquity was under serious doubt. Absurd and funny situations guaranteed. Let me start with good parts. At times the tale was really funny. I laughed out loud several times with one scene being particular good, especially considering this whole scene was played out in Bertie's imagination. So as a humorous book it works - most of the time. The initial problem was entirely my fault. Some scenes in the beginning depend on the knowledge of the previous adventures to be funny. Yours truly jumped from the first book straight to book seven - this one, so some jokes happily flew over my head unnoticed. To be fair I did not let this fact to influence my rating. The following problems did not depend on the knowledge of the previous books. This book strongly reminded me of a joke. A very funny joke with great payoff, but overly long - like it took this whole book to tell this one joke. Once again before this read I was only familiar with the very first book of the series which was an anthology of the short stories, but I think that the short story format works much better for Bertie Wooster and Jeeves. I was not much impressed with Jeeves' solutions for the impossible situations. They seemed to me sort of ordinary; nothing like a brilliant work of mind of Jeeves in the second short story of the first anthology. That one made me an instant fan of the guy. Oh my god this is so, so, so funny. I was discussing Wodehouse with someone yesterday and, as he put it, "There are passages that you want to chase people around the house with, saying, 'Wait! Wait! Just listen to this bit!'" Haven't laughed so hard in a good long while. God, but I love Wodehouse. Classic Wodehouse. It doesn't get any better than this...actually it doesn't get much different than this either. Perhaps that's not entirely fair. For me at least, The Code of the Woosters contains some of my favorite scenes and some of Wodehouse's most memorable characters. Herein his hero Bertie Wooster is at his daffiest, unable to accomplish the simplest of tasks, berating a cow creamer, without getting himself in thick soup. Soon after he's got a Bassett and that malodorous Spode badgering Classic Wodehouse. It doesn't get any better than this...actually it doesn't get much different than this either. Perhaps that's not entirely fair. For me at least, The Code of the Woosters contains some of my favorite scenes and some of Wodehouse's most memorable characters. Herein his hero Bertie Wooster is at his daffiest, unable to accomplish the simplest of tasks, berating a cow creamer, without getting himself in thick soup. Soon after he's got a Bassett and that malodorous Spode badgering him to no end, and this is hot off the heels of a binge to-do in honor of his fish-faced friend Gussie Fink-Nottle, the newt fancier. Everything seems to converge upon poor Bertie in a most pitiless way, providing the reader with hoots galore and good old fashioned British hijinks. "We must say to ourselves: "What would Napoleon have done?" He was the boy in a crisis. He knew his onions." Long have I resisted the fatal charm of P.G. Wodehouse. My previous forays into his oeuvre have been lacklustre. That was until, of course, The Code of the Woosters and I crossed paths. "He paused and swallowed convulsively, like a Pekingese taking a pill." So scrumptious. I should of known that I would of fallen into the trap sooner or later, given my proclivity for novels of a certain kin "We must say to ourselves: "What would Napoleon have done?" He was the boy in a crisis. He knew his onions." So scrumptious. I should of known that I would of fallen into the trap sooner or later, given my proclivity for novels of a certain kind: you know, the jolly-hockey-sticks country house in Surrey à la Nancy Mitford, Evelyn Waugh and Stella Gibbons. "One doesn't want to make a song and dance about one's ancient lineage, of course, but after all the Woosters did come over with the conqueror and were extremely pally with him." My first foray into Wodehouse’s writing, and I’ve fallen for him. The comical and cleverly coined style made this one a fun read, even if the plot only left behind a three-star impression. I finally see where the "Jeeves" came from - and I approve. The highlights of the story were when Master and butler collaborated, argued, or battled protective guard dogs over bed sheets. Fun times! It’s now gotten my attention that this is the third interesting story I’ve read about this form of relationship, and I’ve enjoyed all three. Need to track down more eventually. Bertie runs into foul circumstances and somewhat annoying misunderstandings when he sets out to make things right for his aunt’s cow creamer goal – only to end up sabotaging a friend’s pending marriage, his possible freedom at the hands of a local magistrate, and bungling his aunt’s cow-creamer dreams and his attachment to her cook’s artistic food that he apparently would almost risk his soul for. Not all characters were likeable – I wanted to shake a particular girl – gah, what a nuisance! Kind of like an episode of Green Acres where it’s funny because so many people are exasperating, but while I can stand a 20 something minute episode of Green Acres, I wouldn’t want to sit down for an extended episode that lasted much longer than that. With this book it carried on a bit too much for my nerves, so it wasn’t all fun and games, but still a classic worth reading. I'm always shocked to find that hardly anyone in these United States has ever heard of or read the works of Sir Pelham Grenville Wodehouse.... most indians who read english stumble upon his works sooner or later-more so, I dare say, than the english themselves. I've always maintained that if a Wodehouse book cannot lift your spirits, you must be pretty close to suicide. Amazing plots, memorable characters and superb prose. Long winding complex sentences that never fail to incite peals of laughter, I'm always shocked to find that hardly anyone in these United States has ever heard of or read the works of Sir Pelham Grenville Wodehouse.... most indians who read english stumble upon his works sooner or later-more so, I dare say, than the english themselves. Amazing plots, memorable characters and superb prose. Long winding complex sentences that never fail to incite peals of laughter, long after you've put the book down. Wodehouse is the master of the simile and the metaphor. He can nail a character with just one sentence. His stories are full of estranged lovers, funny misunderstandings, meddlesome aunts, young curates ambitious vicars and absent minded uncles and an absolutely convoluted plot. Bertram Wilberforce Wooster and his "Gentleman's personal gentleman"-the incomparable Reginald Jeeves will remain of of the most memorable characters in literature. "It was a confusion of ideas between him and one of the lions he was hunting in Kenya that had caused A. B. Spottsworth to make the obituary column. He thought the lion was dead, and the lion thought it wasn't." "I could see that, if not actually disgruntled, he was far from being gruntled. " "Memories are like mulligatawny soup in a cheap restaurant. It is best not to stir them. " "You might put it that Hell's foundations are quivering. That is not overstating it, Jeeves?" P.G. Wodehouse was an English writer whose career spanned over seventy years and whose work included almost 100 novels, numerous short stories, 15 plays and 250 lyrics for some thirty musical comedies. Despite his impressive resume and reputation as a "master of English prose", I, unfortunately, wouldn't have known he existed if it hadn't been for Rory Gilmore. I guess that makes me more of a B "You might put it that Hell's foundations are quivering. That is not overstating it, Jeeves?" P.G. Wodehouse was an English writer whose career spanned over seventy years and whose work included almost 100 novels, numerous short stories, 15 plays and 250 lyrics for some thirty musical comedies. Despite his impressive resume and reputation as a "master of English prose", I, unfortunately, wouldn't have known he existed if it hadn't been for Rory Gilmore. I guess that makes me more of a Bertie than a Jeeves. Many of his works include recurring settings and characters. One such set of characters, Bertram Wooster and his clever butler Jeeves, are at the heart of "The Code of the Woosters." "Bertie" is an old school English bachelor who rubs elbows with other upper-class British socialites. He's a bit dim yet extremely loyal (it's part of his own moral *code*), and to say that he has a knack for getting himself into situations is an understatement. Jeeves, his loyal servant, is there to get Bertie out of his entanglements by use of his good sense and keen problem-solving skills. 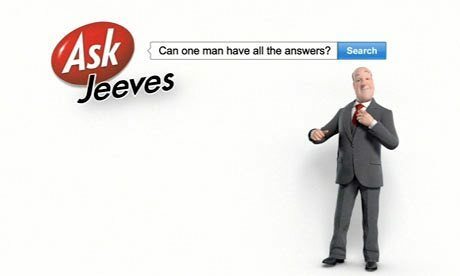 (He's so good with information, he even had a search engine named after him--Ask.com was previously AskJeeves.com). Throughout reading, I was trying to decide how I would best describe Wodehouse's style. The best I could come up with was "Sherlock Holmes meets Three's Company." There are no mysteries here...no murders or missing person cases to be solved. But each particular mess Bertie finds himself in ("the spectacle of as raw a bit of underhanded skulduggery as has ever been perpetrated in a civilized country") requires as much instinct and "know-how" to tidy up as any case Holmes was called in on. The predicaments seem to follow the Three's Company philosphy of situational comedy: If it can happen, it will...and with the most inconvenient timing, ironically, and with things and body parts getting bruised and broken. Throw in some dry, deapan dialogue, a lot of black-mailing, and multiply the shenanigans by ten. On Gussie: "a fish-faced pal", "confirmed recluse", "a less promising prospect (for marriage) it would have seemed impossible to discover in a month of Sundays"
On Madeline Bassett: "a droopy, soupy, sentimental exhibit, with melting eyes and a cooing voice and the most extraordinary views on such things as stars and rabbits"
On Spode: "It was as if Nature had intended to make a gorilla and had changed its mind at the last moment"
Many consider this book to be the funniest of the Jeeves/ Wooster team, and I agree (though IMO, I would give that crown to Right Ho, Jeeves) that it is indeed extremely hilarious. Bertie, saved from the scaffold (i. e. marriage to Madeline Basset who thinks that the stars are God's daisy chain and every time a fairy sheds a tear, a star is born) at the last moment by Jeeves, finds himself ensconced in the country estate of the girl's father along with Gussie Fink-Nottle, her fiancée and Roderic Many consider this book to be the funniest of the Jeeves/ Wooster team, and I agree (though IMO, I would give that crown to Right Ho, Jeeves) that it is indeed extremely hilarious. Bertie, saved from the scaffold (i. e. marriage to Madeline Basset who thinks that the stars are God's daisy chain and every time a fairy sheds a tear, a star is born) at the last moment by Jeeves, finds himself ensconced in the country estate of the girl's father along with Gussie Fink-Nottle, her fiancée and Roderick Spode (the leader of a fascist organisation built on the lines of a Patton tank), who is also in love with Madeline. To further complicate matters, Madeline's father (who is also the district magistrate) is under the impression that Bertie is a kleptomaniac: Roderick Spode is of the opinion that Gussie Fink-Nottle is a "butterfly who toys with women's hearts and casts them aside like soiled gloves" and therefore wants to "pull him inside out and make him swallow himself". Add to this concoction Stephanie Byng, Madeline's flighty cousin who wants her fiancée, the curate Stephen Pinker, to prove himself by stealing the local constable's helmet - and last but not least, Bertie's Aunt Dahlia who has a mission for him - steal Judge Basset's cow-creamer from his ancient brass collection for Uncle Tom. There are engagements which are broken and made up with alacrity, nightly escapades with Bertie on the run from pursuing females, a murderous would-be dictator and a pissed-off policeman, and crime and intrigue which could prove more than a plateful for Holmes and Poirot put together. In the midst of this all, calm and unruffled, is the figure of Jeeves who sets everything right by threatening to disclose the truth about 'Eulalie'. I read an unusual question the other day. It asked, "In a sensationalist age, when everything quickly becomes a matter of passionate intensity, is there a place for the airy trifle?" There are two correct answers to this question. The first is 'Yes, definitely.' The second, and best way to answer this is to just hand the person asking a copy of any Jeeves & Wooster book or, for that matter, anything written by the brilliantly hilarious P.G. Wodehouse. In this insane world, who doesn't need a I read an unusual question the other day. It asked, "In a sensationalist age, when everything quickly becomes a matter of passionate intensity, is there a place for the airy trifle?" There are two correct answers to this question. The first is 'Yes, definitely.' The second, and best way to answer this is to just hand the person asking a copy of any Jeeves & Wooster book or, for that matter, anything written by the brilliantly hilarious P.G. Wodehouse. In this insane world, who doesn't need a little light-hearted piffle on occasion. Classic Wodehouse humor with an insane convergence of many plots all converging with Bertie Wooster at their center. Only his man Jeeves has the brain power to extract him unscathed from the perils that threaten over the silver cow creamer, constable's helmet, a brown notebook, and possible engagement to two young ladies. At its best when being read into one's shell-like. One thing I did notice after all these years is that I now know many more of the half-uttered quotations and references Bertie Classic Wodehouse humor with an insane convergence of many plots all converging with Bertie Wooster at their center. Only his man Jeeves has the brain power to extract him unscathed from the perils that threaten over the silver cow creamer, constable's helmet, a brown notebook, and possible engagement to two young ladies. At its best when being read into one's shell-like. Wodehouse loves to pepper his texts with all kinds of wacky similes, so I would like to start my review with one too: reading one of his novels is like drinking a glass of chilled champagne, on a sunny morning, reclining in a chaisez longue on an impeccably trimmmed English lawn. And Code of the Woosters is a Grand Cru - one of the best years. My previous Wodehouse novels were written in third person, this time Bertie Wooster is the narrator and I noticed an increase in goofiness and general bon Wodehouse loves to pepper his texts with all kinds of wacky similes, so I would like to start my review with one too: reading one of his novels is like drinking a glass of chilled champagne, on a sunny morning, reclining in a chaisez longue on an impeccably trimmmed English lawn. And Code of the Woosters is a Grand Cru - one of the best years. My previous Wodehouse novels were written in third person, this time Bertie Wooster is the narrator and I noticed an increase in goofiness and general bonhomie. A self described boulevardier, he is a well heeled gent with an eye for good food and riotous parties, the only cloud on his horizon being the prospect of marriage. In his own words he feels "hounded like the dickens by a remorseless Fate" every time droopy Madeline announces the break up of her nuptials with Gussy Fink-Nottle. The scene of the action : Totleigh Towers, a sumptuous country residence in Gloucestershire, where young people in love are struggling to overcome the opposition of parents and uncles and the various misunderstandings Fate chooses to throw in the path of their happyness. The arrival of good intentioned Bertie and suave Jeeves serves to complicate matters instead of providing solutions. Actually, I have given up extracting quotes from the text when I realized I interrupted my reading almost every page to jot something down. It's that kind of book. Regretfully, I have little chance now to sprinkle my conversations with Bertie's signature exclamations ( "Dash it!" "What ho!" , "Rather!") and the stylish insults of yonder time are also out of style. It's easier to drop a four letter expletive than to call somebody a "ghastly goggle-eyed piece of gorgonzola". The alliteration pointing at Gussie, obviously. Having watched the BBC production of "Jeeves and Wooster" , reading the novel now was a very visual experience, and I feel I should congratulate the casting department for the excellent choices made. All the actors did an excellent job, especially Gussie, Spode and Madeline were spot on with the book. Well, this should certainly teach us, should it not, never to repine, never to despair, never to allow the upper lip to unstiffen, but always to remember that, no matter how dark the skies may be, the sun is shining somewhere and will eventually come smiling through. I really enjoyed this one. But my favourite joke in the whole thing was when Wooster refers to someone as a ‘sensitive plant’ and is told, “You know your Shelley!” To which he replies, “Am I?” That just about sums up everything I love about Wodehouse. The poetic reference Wooster only uses because he steals it from Jeeves and then his utter bewilderment at what he takes to be a bizarre adjective being used to refer to him. Utter joy. And the women in this one are even more selfish and manipulativ I really enjoyed this one. But my favourite joke in the whole thing was when Wooster refers to someone as a ‘sensitive plant’ and is told, “You know your Shelley!” To which he replies, “Am I?” That just about sums up everything I love about Wodehouse. The poetic reference Wooster only uses because he steals it from Jeeves and then his utter bewilderment at what he takes to be a bizarre adjective being used to refer to him. Utter joy. And the women in this one are even more selfish and manipulative than usual. Wodehouse’s women are a complete joy, a species apart whether aunts or not. I also loved Wodehouse saying, in the darkest before dawn moment, that it would be impossible for all of the ‘nice’ characters in this to get their happy ending. This is something the reader can sympathise with when it is said, and marvel over, knowing even as it is said that somehow the master will untangle the whole mess in satisfyingly perfect fashion – in fact, even with apparent effortlessness. And a fascist even gets bossed around and humiliated by Wooster – someone not known for consistently having it over anyone. Wooster's all-too-human failings with life handing him the wrong end of the stick all being part of the delight these stories offer. Can’t end this review without using the word ‘joy’ for a third time, but that is how I think of these books – something impossible to forget, like a warm smile on a cold afternoon. Sweet gingersnaps, this book is the definition of hilarious. I laughed until I cried. In a nutshell: READ. IT. Cancel the appointments, pretend you don't have a job, put your magnum opus on hold, skip the lessons about learning how to make a Joyful Noise, call off the wedding, forget about sleeping, do whatever it takes to make time in your schedule to read this gem. You will never regret it. Toodle-oo, chums. I toddle off to break the last surviving mantelpiece ornament (read the book, you'll un Sweet gingersnaps, this book is the definition of hilarious. I laughed until I cried. This country house adventure of Bertie and Jeeves concerns the cow creamer and the would-be dictator, and how Bertie defangs him. It also stands out for making reference to the cliches of Regency novel heroes of the silver fork style, which is interesting as this was 1934. Well last night I went to see the West End show: ‘Jeeves & Wooster in Perfect Nonsense’, which is an adaptation of ‘The Code of the Woosters’. My lovely fiancée bought us tickets for Christmas, which truly thrilled me whilst also making me a little anxious. Could any adaptation of what is one of my favourite books live up to my lofty expectations? If it didn’t reach the heights, could I hide my disappointment from my love and thus not seem ungrateful for this wonderful present? I needn’t have worried, I had a whale of a time. Stephen Mangan (from ‘Green Wing’ and ‘Episodes’) is Wooster, with Matthew Macfadyen (who I’ve only ever seen in ‘Ripper Street’ and ‘Frost/Nixon’) is Jeeves. The conceit of the show is that Wooster has been relating his recent adventures at Totleigh Towers to Bingo Little at The Drones, and Bingo has responded by saying it’s so entertaining it should be on the stage. Struck by the brilliance of that idea, Wooster has hired out a theatre and this is that show. Of course Jeeves is there to lend a hand, helping with the scenery and playing himself and other characters; while in addition he has also roped in Aunt Dahlia’s butler, Steppings, to impersonate those who Jeeves can’t himself. And what follows is a comic tour de force. Obviously when you have only three actors playing numerous parts you are really showing off what the theatre can do. And each of the performers is excellent. Mangan is a superbly gormless and constantly cheerful Wooster; while Macfadyen is the perfect and utterly versatile Jeeves. Watching Jeeves pretend to be Sir Watkyn Bassett having a conversation with his niece Stiffy Bing, who Jeeves also happens to be playing in this performance, really does show acting brilliance. (Watching ‘Ripper Street’ one wouldn’t really get the impression that Macfadyen was so funny, or so adept at female impersonation.) The same goes for theatrical actor Mark Hadfield as Steppings, who handles both sides of Aunt Dahlia’s argument with Roderick Spode with aplomb. While the direction and seemless choreography of every set alteration and quick costume change around them is just so exquisite. So, very clever and very funny and technically brilliant, but is it Wodehouse? Well, the answer is a resounding yes. Unlike Hugh Laurie in the TV adaptation, Mangan gets to do a lot of narration, as such Wodehouse’s prose style makes it onto the stage. Obviously it’s in an edited form, but the flavour is there and unmistakeable. And of course the jokes are tried, tested and now absolutely priceless. If I’m honest, the grand telling off Wooster gives Spode (which I quote below) was a bit truncated for my tastes, I would have liked the whole thing delivered gleefully to the rafters. But the fact that we were told before the play even started that if he was to hear a mobile phone device, Mr Wooster would be “not actually disgruntled, but far from being gruntled” more than made up for it and just proved how clever a production this is. It’s apparently on in London until Spring, after which it goes on tour. If you’re a Wodehouse fan (in which case then, of course, you’re a fan of this book), then you needn’t feel any trepidation about purchasing yourself (and maybe your better half) some tickets. There was a temptation, for my second review of this novel in what I now term the ‘Goodreads period ‘ of my life, to just illustrate the wonder and genius of this book with quote after quote. The two above, for instance, stand out as a pair of my absolute favourites in the English language, let alone this book. But the problem with that strategy is there are so many good and quotable lines and jokes in ‘The Code of the Woosters’ – some remembered by me, some not; some, the versions of which I had in my head, were only pale shadows of the lines Wodehouse had conjured on the page – that I would be here all day virtually typing the entire text into the computer. And somehow I can’t imagine the good people at the Wodehouse estate being particularly chuffed at that. Quite simply ‘The Code of the Woosters’ is one of the finest comic novels ever written. It stands at the very top of the Wodehouse canon, and thus is one of the funniest books ever written. Our poor, put-upon hero sets off to Totleigh Towers, home of his nemesis Sir Watkin Bassett. There he finds himself pressed upon from many different sides to steal a silver cow creamer (which is most definitely not modern Dutch); in possession of a purloined policeman’s helmet, and attempting to bring various sundered hearts together again. The precision of the writing, the incredible pace and control of the building farce, and the way that every joke is as light as a soufflé, when it has clearly been worked upon so that every syllable is the right place – makes ‘The Code of the Woosters’ an absolute masterpiece. Even though he writes in a completely different genre (a completely different world even) to me, old P.G. is still one of the authors I draw the most inspiration from. Anyone wanting to improve their own prose should check out Wodehouse. Note the turn of phrase, pay careful attention to the dialogue, marvel at the way the cliche is avoided. Everybody can learn from The Master. The first time I got hit on the head by a bread roll was at the age of twenty one. As a grammar school boy I was an obvious target. The assailant was a Hooray Henry (the generic term for a member of the British minor aristocracy) and the venue a restaurant in the City of London. I felt quite privileged. Many people never have the chance to see the English upper classes recreate a food fight straight out of PG Wodehouse. From an anthropological perspective it was quite wonderful, although crumbs The first time I got hit on the head by a bread roll was at the age of twenty one. As a grammar school boy I was an obvious target. The assailant was a Hooray Henry (the generic term for a member of the British minor aristocracy) and the venue a restaurant in the City of London. I felt quite privileged. Many people never have the chance to see the English upper classes recreate a food fight straight out of PG Wodehouse. From an anthropological perspective it was quite wonderful, although crumbs down the back of the neck itched all night. I hadn’t met a Hooray Henry before before then. Most English people never met a Hooray Henry the whole of their life, although in recent years the average Englishman has seen plenty of Hoorays on our TV screens; the Prime Minister, the Chancellor of the Exchequer (most of the Cabinet in fact), the Mayor of London. I was working with the Hoorays at now notorious accountancy firm based near Temple. My republican views made it difficult at times - I thought the French had worked out how to deal with the aristocracy more than two hundred years earlier. In general, I found it better to keep these views to myself. The Hoorays were OK to me though, so I can’t really complain. They invited me to their parties, but I never got-off with any of their girls who might as well have been aliens. Cassandra, Samantha, Jasmine, Eddie the Head - where are you now? But I do remember how the Hoorays could be very rude to oiks, plebs, foreign types and the tenantry in general. After my middle class upbringing I just didn’t have it in me to be quite so offensive. One evening we were chucked out of the Won Kee Inn (the name is real), a restaurant in Chinatown whose reputation was based entirely on the rudeness of its waiters and the inauthenticity of its food. Being ruder than the waiters in the Won Kee Inn took some doing. Being ruder and being thrown out was in a different league altogether. So for the past two decades I’ve avoided reading P G Wodehouse. I’ve always worried it would bring back too many flashbacks of skirmishes in the English class war, maybe bringing on another episode of class war shellshock. A depressing thought given that the war was comprehensively lost by my class some years ago. The Nasty Party is in office and more Old Etonians in the current Cabinet than were ever in Queen Victoria’s. But after twenty years as a class war refugee in Japan I was prepared to give P G Wodehouse a go. After all, isn’t it really a satire? Shouldn’t I identify with Jeeves, clearly a grammar school boy like me? Can I not read P G Wodehouse as a searing indictment of the hopelessness of English elites and their failure to save the country from its terminal decline? That’s probably going a bit far, but it was a pretty funny book and a very decent read. Bertie’s long lost American cousin, Stanley Morgan Wooster the Third, persuades Bertie’s Scottish banker friend, Shredder McGoodwin, to lend all the bank’s money to rich Mexican peasants buying country houses in the middle of California. Apparently they’ll pay premium prices because the desert reminds them of home. But before the Season’s even over the Mexican peasants have done a runner. Stanley’s bolted off to Brazil like a fox scented by the Quorn and it looks like Shredder’s bank is going to go belly up. It might be back to Bank of Pater and Mater for Bertie and his friends! As the threat of bankruptcy looms a Stygian gloom descends over the Drones Club. But all is not lost when Mervyn Prince, Bertie’s old Bullingdon chum and now Head of the Bank of England, gets a bit of a fright. It turns out that Mervyn’s Italian bimbo Lucinda Lolipopolo - the famous chocolate-hazelnut spread heiress - might lose the inheritance she deposited in Shredder’s bank. Mervyn arranges a bailout, having the Old Lady pass out wads of cash to Bertie and his friends with the same gay abandon Auntie Dahlia hands out kisses on Ladies’ Day at Ascot. Everything’s back on track until some newspaper chaps and chapesses start to stir up the tenantry. Mervyn shouldn’t have given all that cash to Bertie’s chums because it was really the country’s cash and not his to give, they say. Of course this is total tosh, as Mervyn created the dosh in his Threadneedle Street office using his patented “Excelling Spread Sheet” device, just like he always does. It wasn’t anyone’s money, and certainly not the plebs’. Nevertheless Bertie’s friends are in a bit of a tiz, worried they might have to cough up for Mervyn one day. Shredder comes up with the brilliant wheeze of making Bertie Prime Minister so he can kick arse, take names and bury the bodies. After all, Bertie has mastered the common touch and can put the tenantry back in their place. But things are not plain sailing for a new Prime Minister Wooster. Jeeves has done a bunk! Jeeves, it turns out, has made a sly fortune buying and selling privet bushes. Who would have guessed, but there is an awful lot of money in that line of business. Privet, yew, beech - it doesn’t seem to make much difference. Bertie can’t quite get his head round it but, along with a few other smart coves, Jeeves had studied the market and made more money than Croesus from hedges. Jeeves and his so called “hedge fund” friends are bivouacked in the Cayman Islands downing mojitos far away from Prime Minister Wooster’s problems. Or at least that’s what Jeeves wants us to think - turns out it’s a clever ruse for Mr Taxman. Fortunately one night Bertie stumbles across Jeeves helping a lady find her stockings in the one of the private rooms at the Peppermint Rhino, a new East London Gentlemen’s Club competing with the Drones. Jeeves agrees to help out. The country needs some money fast, so Jeeves concocts a cunning plan. He arranges for shares in all the hospitals all across Britain to be sold share-by-share to the patients while they are under heavy sedation, waiting for their operation and too confused to say no. The money from selling the hospitals pays off Bertie’s friends. Bertie’s friends pay off Shredder and Shredder pays off Mervyn, who can continue his tryst with a still flush Lucinda Lolipopolo. Of course the tenantry complain about having to pay to go to the doctor after all this, but who ever told them Harley Street was free? "We must just put our trust in a higher power." MUCH ADO ABOUT A COW-CREAMER AND A POLICEMAN'S HELMET IN TOTLEY TOWERS. But, as usual, Jeeves turns out to be a "WOOLLY, BAA-LAMB" and saves the day, true love and Bertie's hide. I had forgotten how much Wodehouse books make me smile (and sometimes giggle). His Jeeves/Wooster stories are so delightful and are a quick read with maximum effect. Bertie Wooster gets himself into ridiculous situations and improbable adventures on a regular basis and only his very wise and patient man servant, Jeeves, can extract him. And Jeeves has a great talent for allowing Bertie to think that he has come up with the clever ideas himself to solve his self induced problems. The dialogue is t I had forgotten how much Wodehouse books make me smile (and sometimes giggle). His Jeeves/Wooster stories are so delightful and are a quick read with maximum effect. Bertie Wooster gets himself into ridiculous situations and improbable adventures on a regular basis and only his very wise and patient man servant, Jeeves, can extract him. And Jeeves has a great talent for allowing Bertie to think that he has come up with the clever ideas himself to solve his self induced problems. The dialogue is timeless even though most of the stories were written pre-WWII (this book was published in 1938). It is the world of privilege, private clubs, private income, and impeccable manners but that is the beauty of Wodehouse. The reader feels comfortable in a world long gone and with the idiocy of Bertie, his aunts, and his friends from the Drones club. This is a nice "feel good" story that will both entertain and genuinely brighten your mood. It's the kind of story you read when you need to recharge your happy battery and need a big fat smile. Bernie Wooster is especially attrative if you are a fan of British comedy, which I have a real weakness for. The dry humor, the purposely clever phrasing and the awkward social settings were right in my wheelhouse. It reminded me of a gentler, less acerbic (and, admittedly, less funny) version of the 70' This is a nice "feel good" story that will both entertain and genuinely brighten your mood. It's the kind of story you read when you need to recharge your happy battery and need a big fat smile. Bernie Wooster is especially attrative if you are a fan of British comedy, which I have a real weakness for. The dry humor, the purposely clever phrasing and the awkward social settings were right in my wheelhouse. It reminded me of a gentler, less acerbic (and, admittedly, less funny) version of the 70's TV show Fawlty Towers starring the great John Cleese from Monty Python. I imagine such comparisons to Wodehouse's work could be made to much of British comedy given his influence on the genre. A wonderful read and a definite mood enhancer. 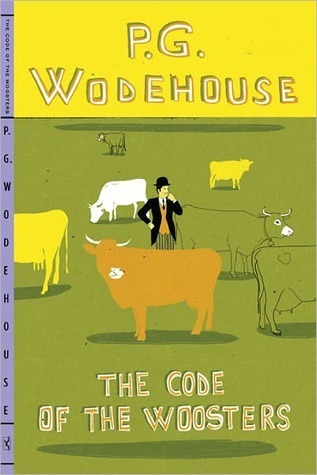 This was my first exposure to Wodehouse and am looking forward to reading/listening to more. I’ve been missing out. For years, P. G. Wodehouse and his hilarious works of fiction have been out of my mind.. and I knew nothing about them. But thanks to Goodreads and his colaborators, I’m really pleased to have such books.. This is one of the best of the Jeeves and Wooster books, filled with all the regulars and a plot that gets ever more convoluted until Jeeves manages to sort everything out for the young master in the end. Madeline is as soupy as ever, still thinking that each time a bunny rabbit sneezes a wee star is born. One can quite understand Bertie's reluctance to enter into the blessed state of matrimony with her. Gussie is as hopeless as ever – not only has he managed to offend Madeline, but he's lost a notebook in which he has carefully jotted down some stinging insults about his host and Roderick Spode, a man whom it's unwise to annoy unless one likes having one's spine tied in a knot. In the interval since we last saw him, Spode has become an aspiring dictator. His followers wear black shorts – unfortunately other dictators had already used black and brown shirts, so his choices were somewhat limited. And to top it all off, Stiffy Byng wants Bertie to steal another policeman's helmet! Dark days, indeed! I listened to the audiobook this time, narrated by Martin Jarvis. He does a great job, giving each person a distinctive voice well suited to his or her character. His Madeline in particular had me in hoots. It occurred to me that men “doing” Wodehouse women actually works rather better than when women act them, because they're written very much from Bertie's perspective and he's baffled by them on the whole. A woman acting Madeline is never as funny as Bertie's descriptions of her. I usually look out for Jonathan Cecil's narrations of the Jeeves books, but Jarvis was just as good once I got used to his different style. Little knowing, as I crossed that threshold, that in about two shakes of a duck’s tail I was to become involved in an imbroglio that would test the Wooster soul as it had seldom been tested before. ১. - "হ্যারল্ড, স্বর্গীয় ভেড়া ! সত্যিই কি ওটা এনেছ তুমি ? " ২. - " নিশ্চয় আমাকে নিরাশ করবে না তুমি ? " - "করব । ঠিক একটা ঘুঘুর মতো নিরাশ করব তোমাকে ।"
৩. "ওকে একটা মৌমাছির চেয়েও বেশি ভালোবাসি আমি । কিন্তু এতে আমার................................."
৪. "খোদাকে ধন্যবাদ যে, সে আগন্তুক তুমি হওনি । পরিস্থিতকে সামাল দেয়া তোমার কম্মো হতো না , ছোট ভেড়া ..............."
"তুমি ভুল করছ , প্রাচীন কলকজা ..............."
Being a miserable old curmudgeon, it generally takes a lot make me laugh out loud (and I’ve seen every episode of 'Last of the Summer Wine' too), however, despite this, I always make a point of never taking any PG Wodehouse with me if I happen to travelling on public transport. Drawing attention to oneself on a bus or train is generally a hateful thing, and I am a man particularly averse to the angry shuffle of newspapers. So, since reading Wodehouse produces from me all manner of involuntary gro Being a miserable old curmudgeon, it generally takes a lot make me laugh out loud (and I’ve seen every episode of 'Last of the Summer Wine' too), however, despite this, I always make a point of never taking any PG Wodehouse with me if I happen to travelling on public transport. Drawing attention to oneself on a bus or train is generally a hateful thing, and I am a man particularly averse to the angry shuffle of newspapers. So, since reading Wodehouse produces from me all manner of involuntary groans, guffaws and snotty bawls, I find it best avoided. There’s just nothing bad to say about Wodehouse - his books are beautifully crafted, his use of language is exceptional, and his characters - though perhaps not always very likely - are always brilliantly funny. The fictional world that Wodehouse creates with his 96 novels - a place filled with jaunty young men (usually in spats), Dover Street clubs, omniscient servants, insane aunts, country piles, idiotic schemes and a seemingly constant threat of marriage - is, putting it simply, just much better than real life.